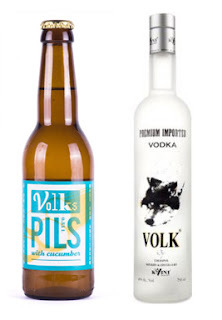 The TTABlog®: TTAB Test: Is "VOLKS PILS" For Beer Confusable With "VOLK" for Vodka? TTAB Test: Is "VOLKS PILS" For Beer Confusable With "VOLK" for Vodka? The USPTO refused registration of the mark VOLKS PILS for "beer, lager" [PILS disclaimed], finding it likely to cause confusion with the registered mark VOLK for vodka. Applicant Marshall Brewing pointed to some 50 pairs of registrations for the same or similar marks for beer and vodka, owned by different entities, as proof that the goods are not related. How do you think this came out? In re Marshall Brewing Company, LLC, Serial No. 87019347 (April 9, 2018) [not precedential] (Opinion by Judge Marc A. Bergsman). The Marks: The Board wasted little time in finding the marks confusingly similar, concluding that the addition of the letter "S" and the descriptive term "Pils" to the cited mark failed to distinguish the marks at issue. The Goods: Examining Attorney Leslie Ann Thomas-Riggs submitted 12 use-based registrations covering both beer and vodka, as well as Internet evidence showing that beer, lager, and vodka may originate from a common source. News articles discussed the expansion by brewers into the distilling of spirits, including vodka. Applicant Marshall pointed out that "beer" appears in the identification of goods in 14,009 live, use-based trademark registrations in class 32, and vodka in 1,980 use-based registrations in class 33. However, only 35 registrations cover both beer and vodka. The Board found this evidence of little probative value since it did not indicate whether the same entity has separate registrations for vodka and beer. Applicant also submitted 109 pairs of third-party registrations for the same or similar marks owned by different entities, for beer and vodka. However, the Board found that half the registration pairs were for marks that were not similar. As to the other half, those registrations did not rebut the Examining Attorney's evidence because "[t]here is no requirement for goods to be found related that all or even a majority of the sources of one product must also be sources of the other product." Here, the evidence clearly demonstrates that there are entities that are the source of both vodka and beer. The Board therefore concluded that the goods are related for Section 2(d) purposes. Conditions of Sale: Because there are no limitations in the application and cited registration, the Board must presume that the goods travel in all normal channels of trade and are offered to all the usual classes of consumers for those goods. Potential customers are ordinary consumers who purchase and drink alcoholic beverages and include consumers who may buy inexpensive beer, lager, or vodka on impulse. Conclusion: Balancing the relevant du Pont factors, the Board found confusion likely and it affirmed the refusal to register. TTABlog comment: Are all alcoholic beverages related under Section 2(d)? There is no per se rule saying so! I hear that all alcoholic beverages are related to t-shirts, as well. I'm sick of the way that the Board discards any evidence offered by applicant's prior registrations, but accepts without question anything an examiner offers. I have always had difficulty with the notion that all alcoholic beverages are considered the same in a likelihood of confusion analysis. I am not aware of any brewer that makes vodka and no vodka distillery that makes beer. Although they may be in the same store, it is unlikely that they would ever appear side-by-side. In the present case, I doubt that any ordinary consumer, such as myself, would ever be confused. We continually fight and lose when arguing that these beverages do not travel in the same channels of trade. It is my believe that small differences in the marks would make a major impact on the likelihood of confusion analysis under these scenarios. Though I usually hate these nearly per se relatedness examples, it looks to me that the Examining Attorney did a pretty good job establishing that vodka and beers emanate from a single source. While I might not be confused in the store, this seemed pretty compelling from a TTAB standpoint. If in reality, these different types of alcoholic beverages are truly in different channels of trade, then the applicant should be able to obtain a consent from the registrant. I don't know how often that actually happens. However, based upon a recent opposition I was involved in between two alcoholic beverage mark owners, it seems like the liquor distributors might have a lot to say about consenting to or opposing a similar mark whether or not the channels of trade may be similar and the likelihood of confusion increased. And in the U.S., it is my understanding that liquor distributors and manufacturers (mark owners?) can never be the same company. Quick, off the top of your head, name one brand that is both a vodka and a beer, by the same producer. You can’t. You can’t because it’s relatively rare. Consumers are not going to believe the VOLKS PILS beer is made by the company that makes VOLK vodka because consumers generally do not pump breweries and distilleries together, or beer brands and vodka brands together.